British made Goodwin Air Plasma cutting machinery are great mechanised or manual plasma cutters made in England. 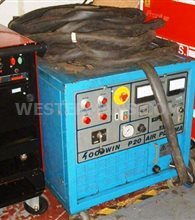 Westermans International buy and sell Goodwin Plasma Cutting machinery and equipment as a top quality, reliable British brand built to last. Reasonable and robust, these are great plasma machines favoured by Asia especially India and Pakistan. Buying pre-used offers you the customers an afforable high quality plasma cutter for life. Need new OEM spares? We can supply these too. Have a Goodwin plasma cutter in your workshop, want a new torch, longer torch, a service or repair to it. Then ask the Sales Team for more details. Older models for sale include the P3i, P18, P20, P30 and P50 plasma cutting range. The logical development of our original 20kw machine which has been proven in so many applications world-wide, the P30 offers 50% more output and is able to cut 65mm thick metals, and, thanks to in-built power factor correction, draws less current from the supply. Offering great mobility the standard model has fixed power output for simplicity of operation, making it ideal for scrap processing, demolition, and any other application that can make full use of cutting performance at all times. The P30 PLUS offers full electronic control of output and soft start, for greater versatility in more demanding applications, especially when cutting with a machine torch on a profiling machine, robot, or other mechanised application, or if you are hand cutting a wide range of materials. "S" variants are also available for foundry work, gouging and whenever close cutting is required. Able to cut all day and every day, these machines can produce a prodigious output of work, giving rapid payback and enormous savings which will continue as long as your requirement is there. What is believed to be the worlds first purpose made plasma cutting system for use by divers, has been developed over the last 3 years. Working closely with the UK Ministry of Defence, with input from the Royal and U.S. Navy’s and others, the potential hazards have been identified, and solutions found to eliminate risk. The equipment has so far been proven in trials down to 30m (100’) depth, cutting metals to 40mm (1.5”) thick. Plasma Arc metal cutting equipment typically uses voltages of 300 v or more, against a background of Codes of Practice in diving work favouring no more than 30 volts. Whilst plasma cutting equipment has occasionally been used underwater, there have been risks present requiring very careful application of safe working practices. This equipment is designed to control electrical leakage paths at source and prevent them reaching the diver. The methods have application to any exposed voltage process where currently shocks are routinely experienced. The very high cutting speeds possible with AIR PLASMA cutting equipment give enormous gains in productive capacity. The combination of this high productivity and low running cost gives you a very rapid payback in the purchase of the equipment. You can cut any metal at these speeds and unlike any other thermal cutting process, no expensive gas or other supply is needed, only electricity. Manufactured under the Goodwin brand to a very high performance and high quality standard of machinery. The speed of cut gives you quality advantages because very little heat is put into the material surrounding the cut, giving you accurate components with minimal distortion and clean out edges with negligible heat effected zone, thereby eliminating many secondary operations required when using other cutting methods. The Goodwin range also includes the world's first plasma equipment specially designed for use underwater by divers. 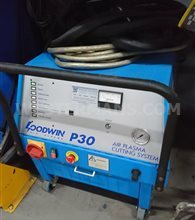 We want to buy your old Goodwin plasma cutter follow the link for more details. Top prices paid.